There are tons of things that small businesses spend for or pay for on a daily basis. There are those that require a big amount of money, so a check is issued to have it paid. There are also those that are just small amounts and do not require a check to be issued at all. These things are taken cared of by petty cash. A petty cash is the on-hand cash that small businesses use to pay for what they owe in small amounts. You may also see payment receipt formats. The use of a petty cash must be tracked and recorded at all time so that businesses would know where the money from the petty cash fund went to. This is still money coming from the business, that is why it should be part of the business accounting. 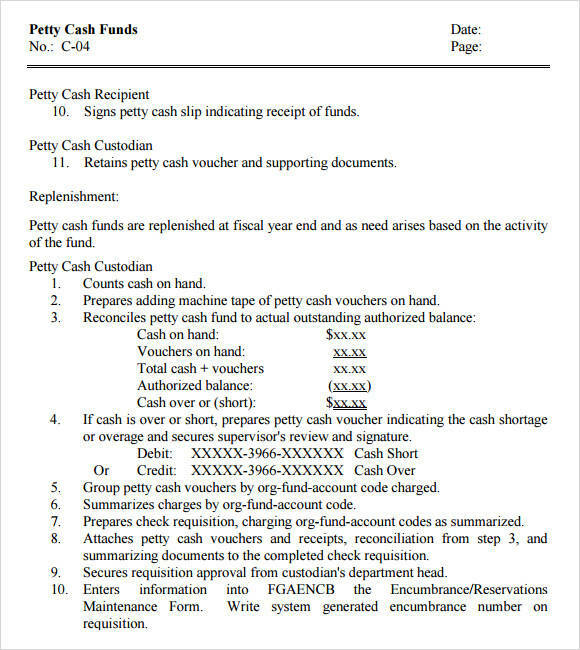 Petty cash receipts are issued to keep track and record the use of the funds, and help determine if they were used appropriately. 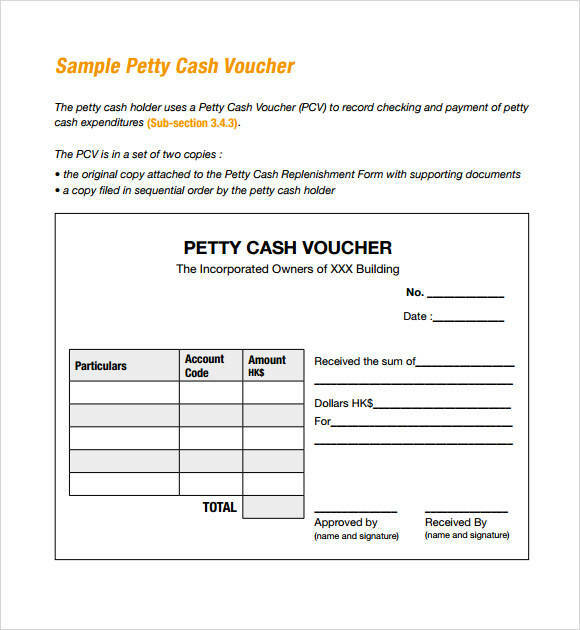 Below are some petty cash receipt templates available for you to download and use, as well as information that can help you learn about them. Petty cash receipts serve as records for any amount taken from the petty cash fund so that the use of the funds can be tracked and justified. They are also being logged in petty cash logs. 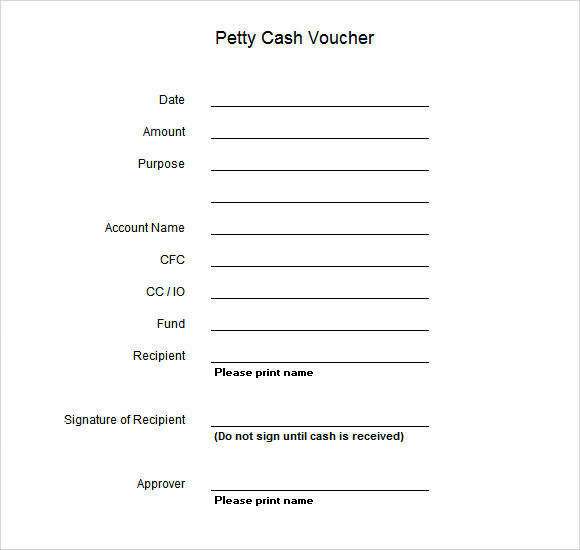 Petty cash receipts are attached to petty cash request forms every time a request is made to replenish the already depleted petty cash funds. The total amount provided by all petty cash receipts should be the same as the amount taken from the petty cash fund. Who Signs a Petty Cash Receipt? Petty cash funds need to be monitored and managed by a trusted individual. The person who is responsible for taking care of the petty cash fund is called a petty cash custodian. Every time money is used to pay for something related to the business, the petty cash custodian issues a petty cash receipt. They are the only ones who are authorized to do so, thus their signature is required on any petty cash receipt. 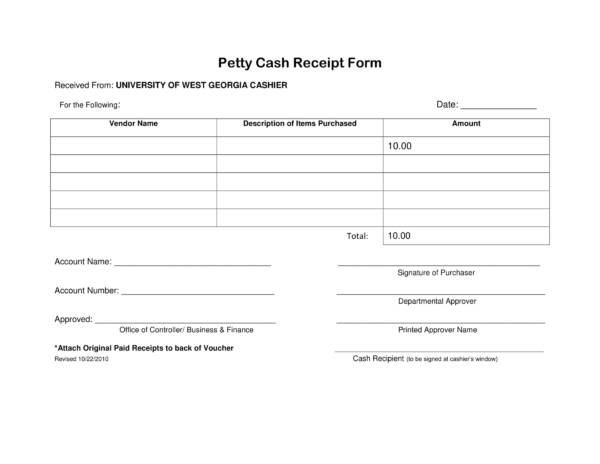 Another important signature required in a petty cash receipt is the signature of the recipient. This is done to ensure that the funds were used properly and not just for random and unrelated things. A different procedure may be followed by different kinds of receipts samples or templates, like order receipt samples and templates, sales receipt samples and templates, and company receipt samples and templates. How Much Money Should Be in a Petty Cash Fund? The amount of money that every business allots for their petty cash fund varies depending on their needs. The amount ranges from $50 up to $200. How can a business tell if such amount is enough for their petty cash fund? There are determinants that can help business decide on this matter. These determinants could be the type or nature of the business, the size of the business, and the needs of the business. Small businesses would only require a small amount while medium-sized businesses may need more. You may also see cash payment receipts. Petty cash funds are common in small businesses in situations where the need to issue a check is not necessary. This system may not be applicable to other forms of businesses, especially large scale business, because it is more convenient for them to issue checks or use credit cards and keep credit card receipts. How Is Petty Cash Replenished? When is it time to replenish a petty cash fund? It is the job of the petty cash custodian to monitor if the petty cash fund is already running low. If it is, then the petty cash custodian will request for it to be topped up. 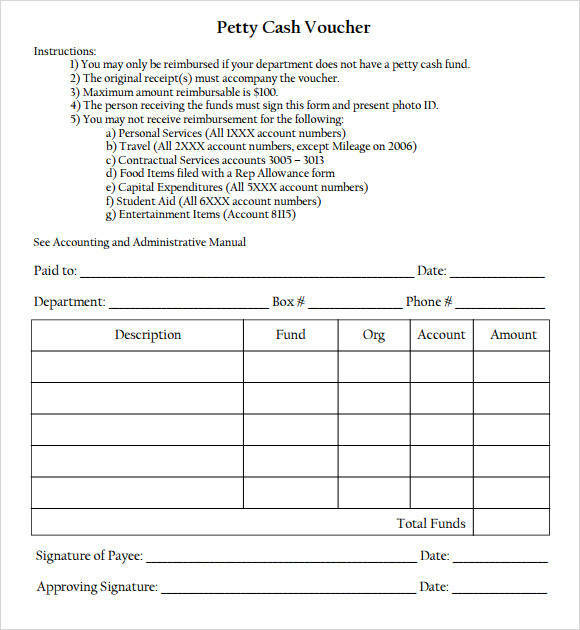 A petty cash receipt form is filled out and the petty cash receipts or petty cash vouchers for the covered period are attached together with the form. A check is then issued for the required amount which is debited as part of the offices expenses. After encashing the check, the money is then added to the petty cash fund so the custodian again has the original amount of cash for the funds. How Is Petty Cash Fund Stored? Well, even if petty cash custodians are responsible for keeping track of a business’s petty cash, they don’t really carry the money around with them. Petty cash is cash on hand. It seems likely that if cash is involved, potential abuse or misuse will always be present. So to keep it partially away from any potential abuse, petty cash funds are stored in a cash box. These cash boxes should always be locked and there should only be one person who holds the key to this lock, and that is the petty cash custodian. So whenever there are any missing funds or discrepancies, there is only one person to interrogate about it and that is the petty cash custodian. You may also like money receipt samples. Why Are Petty Cash Receipts Important? Keeping track of money matters can become a problem if ti is not recorded or tracked properly. This may lead to the total loss of a certain amount whose use is not determined or may seem illegal. This is where petty cash receipts come into the limelight. 1. Petty cash receipts are an important recording and tracking tool, especially if it deals with cash payments. Keeping records of cash receipts can greatly help a business in accounting for the business’s expenditures and help answer questions about where the cash funds were used. You may also check out payment receipt acknowledgment. 2. Small purchases, like gas purchases, employee meals or office supplies, are reimbursed and paid with the use of petty cash funds. The release of funds is authorized and tracked through a petty cash receipt. 3. It serves as a reliable source or document that can be used when the need arises. You might be interested in general receipt templates. 4. It is one of the many processes that helps in conducting and running a business successfully. No matter what type of receipt it is that you are using, always keep in mind that it is not just a piece of paper that you can easily get rid of or throw away. There is more to it than just being a piece of paper and it may help you solve money issues that you think can never be resolved. More receipt-related topics are up on our website. Examples are purchase receipt templates, store receipt templates, and payment receipt templates. There are a few important things you can see in a petty cash receipt and they are often the same no matter where it is used. The following are the parts of a petty cash and their uses. You may also see sample advance payment receipts. It always include the words petty cash in it, as well as the name of the business or establishment using and issuing it. 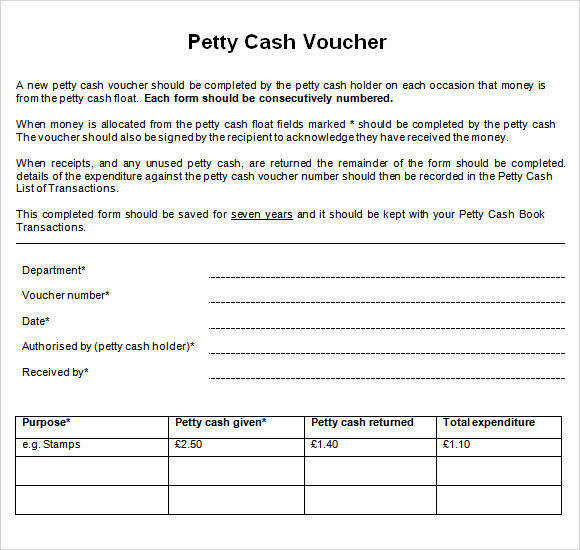 Most petty cash templates provide instructions so that they can be used or filled in appropriately or the way the management want it to be used. You may also like sample house rent receipts. This determines the entity who has received the money from the petty cash funds and proves that it is really used for the stated purpose. This refers to the date when the funds were requested. This refers to the date when the funds were provided or issued to the recipient. You may also check out rental receipt samples. The purpose or the reason why such amount is requested and paid to the particular entity. The remaining balance after the requested amount was taken out is recorded in this part of the petty cash receipt. This is the total amount spent by someone to cover up expenses for the business. You might be interested in fundraiser receipt templates. This refers to the exact amount requested and provided to the recipient. Petty cash funds can only be released and approved with the name and signature of the petty cash custodian. This is the indication that they are aware of such spending and has given approval that the request is just and appropriate. You may also see taxi receipt templates. All of the parts listed above are important in any forms of petty cash receipt and should be present at all time. 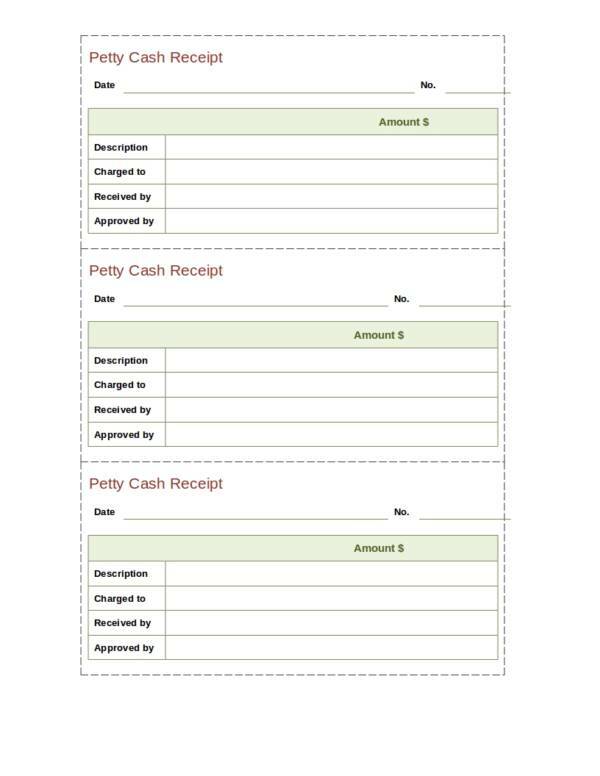 Petty cash receipts may look a little different from the other receipts we are used to seeing, so if you need to familiarize the parts of other recipients, you may do so by checking out other related topics and some samples and templates on our website. Some of the topics you can find there are Parking Receipt Samples, Grocery Payment Receipt Samples & Templates, and Refund Receipt Samples & Templates. There are a lot ways on how you can get hold of petty cash receipts. You may purchase them from stores selling school supplies or in some convenience stores. However, if you wish to make one of your own, then here are a few steps that you might find useful. You may also see official receipt samples. 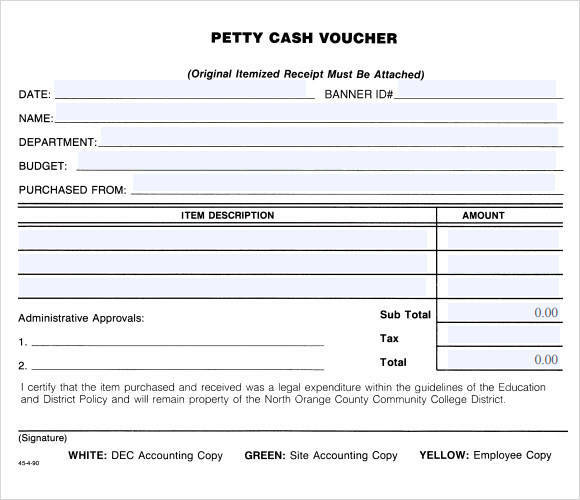 There are two ways on how you can make your own petty cash receipt. One way is by using petty cash templates that are available online for free or by making one from scratch. Browse online and look for a petty cash template that you think is useful to you or one which you preferred. Download the template and then open the downloaded file. To make changes to the template, just highlight the parts that you need to change or remove and then click the backspace button. You may then change what was written there. You may also like blank receipt templates. After making the desired changes, go ahead and save your work. You will need a petty cash receipt sample or template as your guide or reference to help you with what you are about to make. 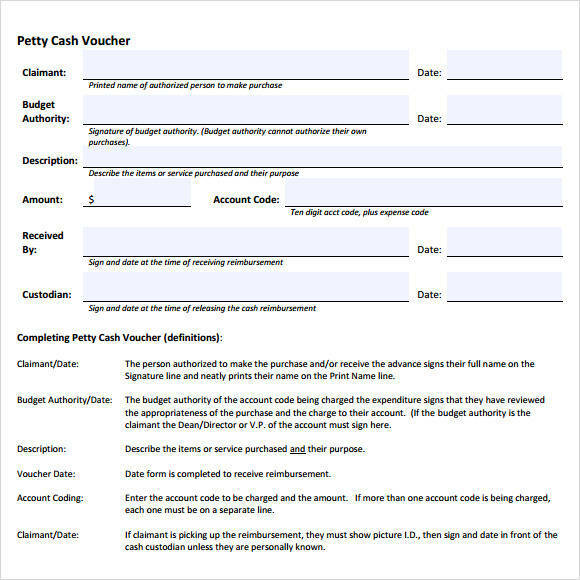 Make a draft or outline of how you want your petty cash receipt to look and also include where you would put the different parts. Use the samples or templates to help you decide on where to put what and other details. It will make your work faster. You may also see doctors receipt templates. Choose the application you would want to use to create your receipt. It could be any of the popular application being used today, like Word, Excel, or PDF. Any is fine provided that you have these applications installed on your computer or laptop and allows you to create files from them. This time, the draft or the outline you make will now be the tool you will use as reference to make your final petty cash receipt template. Transfer the contents of your draft or outline to the final sheet or working sheet. After doing so, review your work and make sure that everything you need is in there. Proceed with saving your template to the desired location and file name. Print as many copies as you need. If you need more copies in the future, you can also print them using the template you just made. You may also like acknowledgement receipt samples. Which way do you prefer for making your own petty cash template? Whichever you choose, both steps will still help you come up with a useful and effective petty cash template that you can use for your business. There are also steps provided on how you can make other types of receipt. Just check out receipt related topics on our website, like Simple Steps to Create a Receipt in Excel, How to Make a Receipt Using Microsoft Word, and How to Make a PDF Receipt Template. Petty cash receipt has some advantages that are sure to be good for you if you use them. If you want to find out what they are, you can simply check out the list that we have made below. 1. 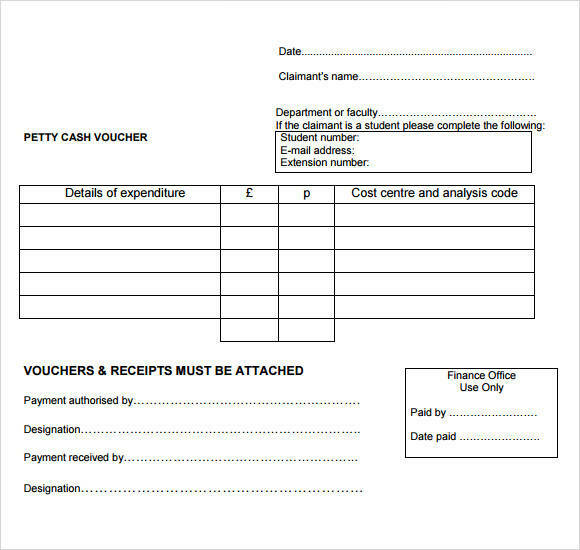 Petty cash receipt templates can easily be searched and downloaded online. There are paid templates, but there are more free templates that you can choose from. They also come in different forms and varieties so you are sure to find what you exactly need. 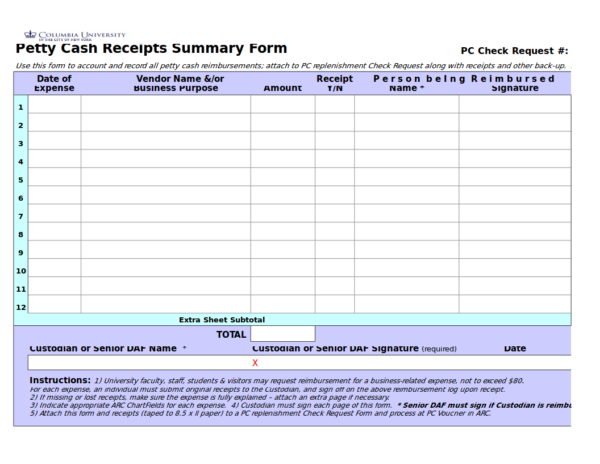 You may also see photography receipt template. 2. 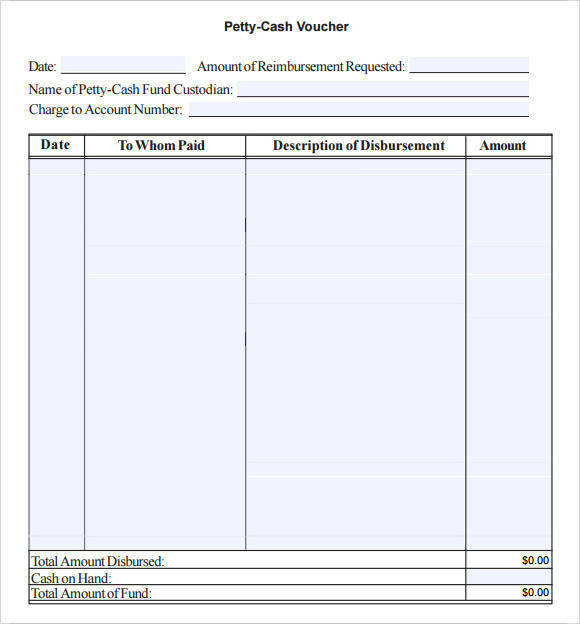 Petty cash receipt templates are easy and convenient to edit and use. The templates available are mostly provided in editable documents so you won’t have any problems using them. Also, since the details are already laid out for you, you will only need to do minor changes to get what you need. You may also like service receipt templates. 3. It helps you create a petty cash receipt in just minutes. The template is already detailed and complete so you just pretty much need to download and print it, and you are done. 4. In addition, using petty cash receipt templates will help you save time. You no longer have to manually write down the details every time money from the petty cash fund is used. You just simply fill out the template, have it signed, and you’re done. You may also cehck out restaurant receipt templates. 5. There is little to no risk of forgetting important details or information with the use of a petty cash template because the parts of every template are guaranteed to be complete. 6. There are two easy ways on how you can create petty cash templates, which is great because you are not stuck with just one option. 7. 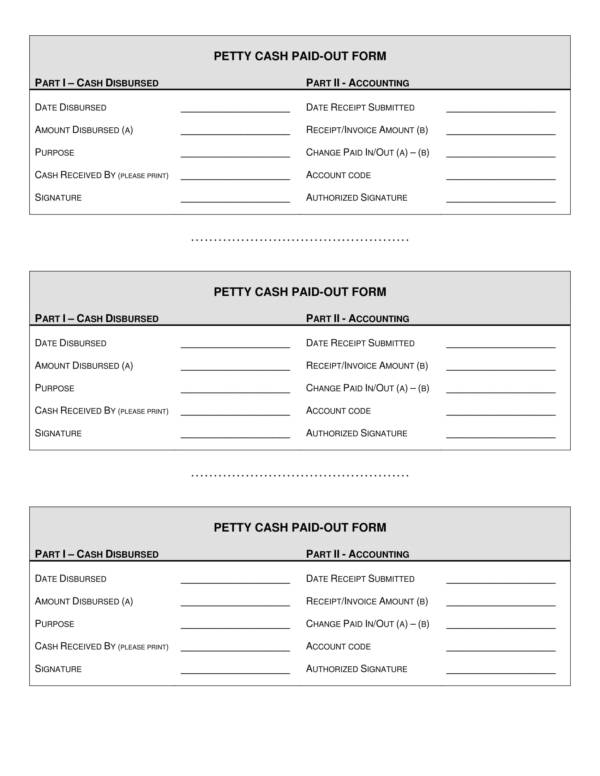 Petty cash receipt templates are not flooded with details like that of contract templates or payment forms. This makes it easy to create one from scratch. Don’t you just find these advantages wonderful and interesting at the same time? We hope that we are able to impart important and useful information about petty cash and petty cash receipts. We also hope that you are able to find the samples we have provided useful. If you would like to know more about petty cash receipts or check out other receipt templates, you are free to visit our website anytime. Some of the interesting topics that you can find there are cash slip templates, construction receipt templates, and loan receipt templates.